What Is A Firewall Security And How Does It Works? Tags: what is firewall network security? What Is A Firewall And How Does It Work..? A Firewall is either Hardware or Software based Network Security System that controls incoming and outgoing Network Traffic. 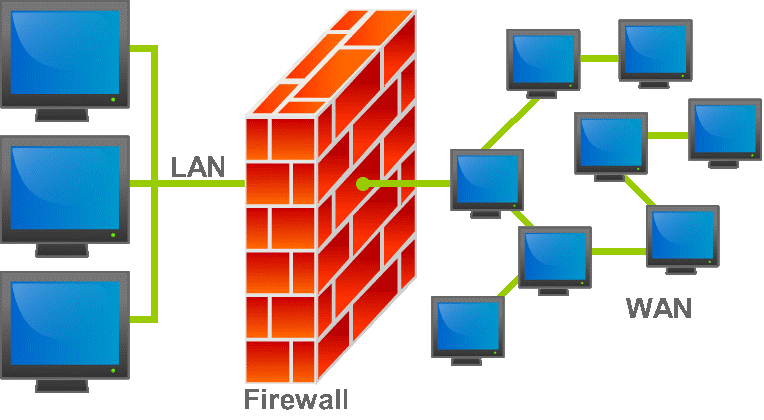 Firewalls are categorized as either Network Firewalls or Host-based Firewalls. Network Firewall filter traffic between two or more Networks and Host-based Firewalls run on host computers. It control network traffic in and out of those machines. Firewalls works as a First Line of Defence in Network Security since 25 Years. It also established a barrier between Secure and Control internal networks that can be trusted and untrusted other networks, like Internet. Let's quickly discuss the main types of Network Firewall. The architecture of Pocket-Filtering Firewalls are the most basic and oldest firewall architecture which create a checkpoint at a Router or Switch. These types of Firewalls perform a simple check of the data packets coming through the Router and inspect information such as the destination and orientation IP address, Packet type, Port number, and other surface-level information without opening up the packet to inspect its content. The Stateful Inspection Firewall combines both Packet inspection technology and TCP handshake verification. This verification create a level of protection greater than either of the previous two architecture could provide alone. This type of firewall allows or blocks traffic based on state, port, and protocol. Also it monitors all activity from the opening of a connection until it is closed. A Unified Threat Management (UTM) device typically combines in a loosely coupled way and usually include functions such as Antivirus, anti-spyware, Network Firewalling, intrusion detection and prevention etc. It also include some additional services like cloud management. UTM firewalls helps to secure network security. Next-Generation Firewall (NGFW) is the third generation firewall technology that is implemented in either Hardware or Software. It is evolved beyond simple packet filtering and stateful inspection. It is capable to detect and block modern threats such as advanced malware and application-layer attacks. Threat-Focused NGFW (Next Generation Firewall) include all the capabilities of a traditional NGFW that provide advanced threat detection and remediation. It also helps to detect which assets are most at risk with complete context awareness, quickly react to attacks with intelligent security automation that sets policies. Threat-Focused NGFW hardens your defences dynamical, better detect evasive or suspicious activity with Network and Endpoint event correlation. How Do Firewall Protect Your Business..? As Firewall plays an important role in Network Security, most of the businesses wants to install firewall security. It can protect against malicious activity on the internet, such as hackers using “Malware” malicious programme often disguised as legitimate software to get at their private data. It works to block unauthorized access to computers. Mainly there are two types of Firewall that used in small businesses as Hardware Firewall and Software Firewall. Following are the main uses of Firewall Network Security that businesses are looking for. Firewall have some key feature in Network Security that helps businesses to provide a higher level of security. Firewalls are the system which protect network devices, like industrial PCs, Control systems, Cameras, etc. unauthorised access by preventing network traffic to or from these system. The main fundamental technical features of any Firewall is to filter packets. The firewall inspects packets, which it is supposed to forward, to determine whether they correspond to a desired template for traffic pattern. Do I Need Firewall Network Security..? Nowadays, all business focuses on how to secure data and how their valuable information can saved. As cybercrime is on the rise, which has led to all the companies gearing up to protect their data. Network Security become a top priority for any business to prevent it from cyber-attack. One of the Best Network Security is Firewall Security and to keep this maintained, businesses should invest to configure it from technician that handle regular maintenance and emergency situations. It plays an important role in Network Security.